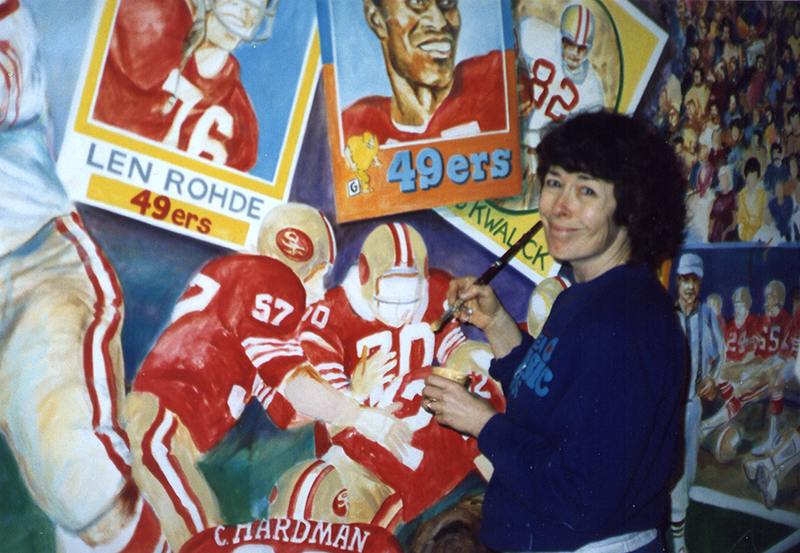 How painting a mural about the 49'ers made a football fan out of me. 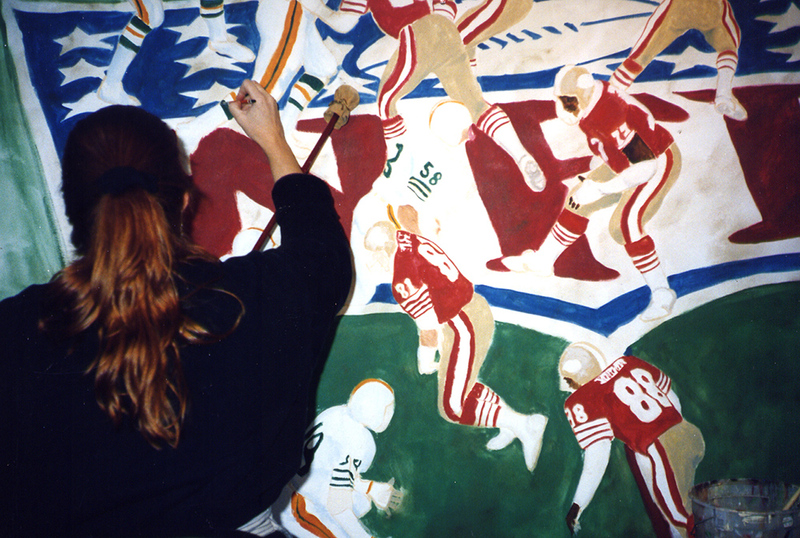 In 1994 my friend and colleague Jennifer Ewing and I teamed up to paint an 80 foot long mural depicting the "History of the San Francisco 49'ers" for a Burger King in Mountain View, CA. The restaurant was owned by Len Rohde and his wife, Bev. Len had been an offensive lineman for the 49ers for 15 seasons (1960-1974) and subsequently had other careers including teaching, coaching football, and owning franchises. 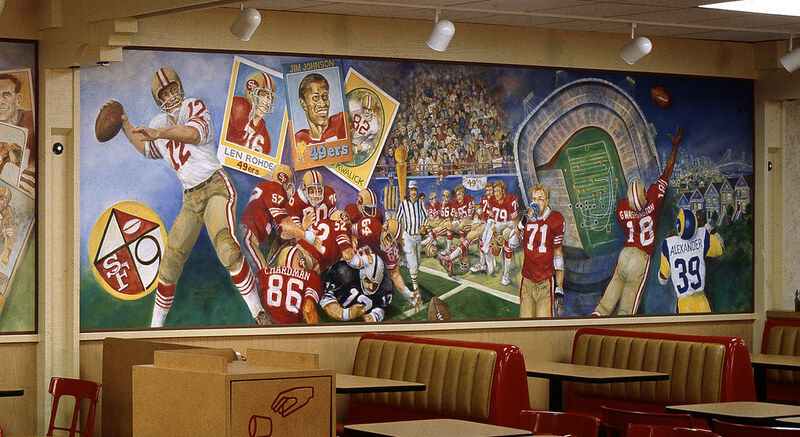 During the 75th season of the NFL, and the 49'ers team nearing its 50th anniversary, the Rohdes wanted to decorate their flagship restaurant in a bright football theme. The site has a long, narrow dining room and four wall panels about 20 wide and only 5 feet tall. Bev and Len provided us with piles of 49'ers football memorabilia: photos, names, milestones, ephemera; and we started arranging these things scrap-book style on large pieces of paper to assist the composition framing highlights in the team's history. We painted the mural on long canvas panels in the studio, then installed them on site. During the painting of these murals, I learned a tremendous amount about working with the color red. Red jerseys, red pennants, the red and gold uniforms changing from burgundy to glossy candy apple red to bright fire engine red over the years. Local favorite, quarterback John Brodie (#12), opens the second panel. In 1970 the team moved to Candlestick Park. Certain Raiders fans in my life took exception to the choice of Ken Stabler (also #12) as the sacked quarterback, but we decided there ought to be some black in the mural. The view on the far right shows the Bay Bridge, seen from Potrero Hill, where I live. "...this wasn't just a large-scale, colorful, commercial job, but a testament to an important part of San Francisco history." Football-fan friends, relatives, and former clients, came out of the woodwork with memorabilia, photographs, and stories of great games past. People dropped by the studio a lot, and we began to realize that this wasn't just a large-scale, colorful, commercial job, but a testament to an important part of San Francisco history. 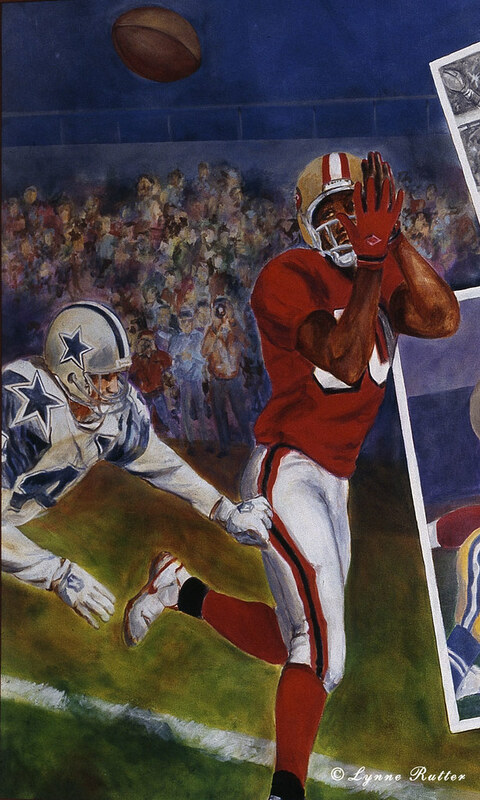 Accuracy was crucial - any fan that saw this painting would already know who was left-handed, how many yards so-and-so rushed, what is meant by "The Catch" and what happened on September 5, 1994 that really mattered. The Rohdes made frequent visits with reference materials, and Len taught me how to throw a perfect spiral down the long hallway next to the studio. I took to wearing a replica of Joe Montana's jersey while painting, for inspiration. Jennifer arranged a shrine of memorabilia next to her desk. While we were finishing this painting the 49'ers once again won the playoffs and headed for the Super Bowl. Our clients did not mind waiting until after the game had been played so we could design the right end of this mural to reflect the 49'ers victory in Super Bowl XXIX. Prior to installing the mural Jennifer and I held a "tailgate party" in the studio as a send-off for the over 80 mythic football heroes portrayed in this mural. Legend has it that the Forty Niners will once again go to the Super Bowl, when we are next commissioned to paint about them. Congratulations to Jerry Rice, who was elected to the Pro Football Hall of Fame today!! You can enjoy this mural with your lunch at Burger King, 177 East El Camino Real, Mountain View, California. the site of this mural has been redeveloped and the murals are being installed in their new home in Santa Clara. Incredible story....incredible mural...no, really, it IS incredible!! Awesome murals wow! Such talent! My brother and I grew up admiring these murals and were just wondering if there were any photos of them on-line. Google search brought us to this blog post! Thank you for sharing their story, wonderful work. Did the murals ever get reinstalled at Levi's Stadium? Yes they were installed in Levi's Stadium! Thanks for commenting! Len Rohde passed away last Saturday. He was 79. RIP. Oh no I had not head that. What sad news. Thanks for letting me know. Len was an awesome guy.